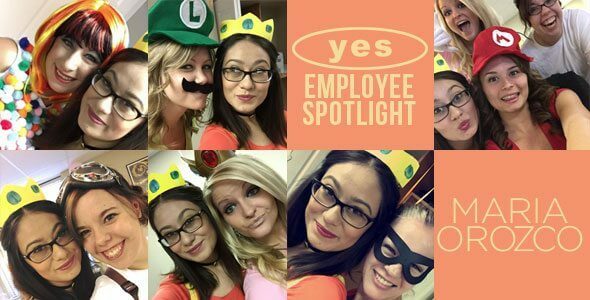 The Best Utah Staffing and Recruiting People Work at YES! Please give it up for this month's Employee Spotlight…. Your Employment Solutions is extremely fortunate to have an employee like Maria Orozco! Maria began as the receptionist in our corporate North Salt Lake office and has since moved into an administrative position in our Human Resources department. Whether directly or indirectly, she supports every single person in the company and has always done so in such a positive and supportive way. She is an extremely fun, friendly, and dependable employee that we are all lucky enough to call our friend! Thank you Maria for all that you do! The thing I like most about YES is that we are all so different and yet so understanding about each other. Everyone has a great attitude and energy, I love it. The one thing that could make YES better if we had a real mascot. Like a YES dog or bunny (no cats because that would kill Steph). If I could meet anyone it would be Pope Francis. He is the only other person that I would really like to meet before I die. My room. Its like perfect. If I had a mini fridge in there I would never leave. 7. If you were given the choice between a free lifetime of shopping at Forever 21 or staying 21 forever, which would you choose? Easy! Lifetime of shopping at Forever 21. I will be 80 an rocking a cute dress from their Love collection. The biggest challenge I have is getting everything submitted on time. Whether that be paperwork, scanning, or payroll. I set goals and try to give myself time to focus on one thing at a time. We really try to place people in places that they can work at. We want people to be in the right position because then the client is happy, the worker is happy, and that makes us WAY happy. 11. You, Reed, and Kerry are the last 3 survivors of the 76th Hunger Games. How does it end? Who is the Victor? The arena is the YES office. Reed is staking out the lobby, his weapon is smart phone and strength. Kerry is In the dark in the back offices he is using the pens as weapons. I'm in the hall way of the restrooms loaded with Nerf guns. Kerry and I form an alliance and go and attack Reed. He is too fast. Kerry gets to him first and Reed just knocks him out! He runs up the stairs as I’m shooting at him, I run out of ammo. Thats the end for me. Reed jumps down from the top of the stairs. Two cannons go off and Reed is the winner. Thanks Maria for all you do to make Your Employment Solutions the best staffing agency in Utah!